What better way to feel all loved up this Valentine’s Day than by finding The One? For two days, Noosa-based bridal designer, Erin Clare’s designs will be on show at Brisbane bridal boutique, White Lily Couture. Erin’s made-to-measure gowns are lovingly handmade by the label’s Sunshine Coast team. This is a must-go event for brides still searching for their dream gowns. Special deals and gift with purchase available with Erin Clare Couture purchases over the two-day trunk show. Appointments available Friday February 17 10:00am to 6:00pm, and Saturday 18 9:00am to 5:00pm. To book your appointment, call (07) 3367 8870. Your love story captured on film by cinematographers, Jensen & Young. This is such a great way to capture a unique moment in time you will be able to experience over and over again for years to come. How you feel right now shared in your own words in a 45-second film with a bonus 10 still images for only $450. We love this idea for putting out as your save-the-date or engagement announcement. Another sweet idea is to play your film for all your guests at your wedding reception. Get ready to “Awwww!” with this cute-as-a-button love story film by Jensen & Young. You’re crazy if you don’t put your order in for this one… or spoil yourself! After all, nothing says love like a dreamy delicately arrangement of blooms. Willow Bud Shop is offering free local delivery from Coolum to Caloundra, Mapleton to Montville and everywhere within the area for orders over $60.00. Celebrate that someone special with stylish, sophisticated flowers and bespoke giftware. To celebrate the most romantic month of them all, Noosa Boathouse is offering free 4x4m dance floor hire and a $10 per head saving on all food packages booked for either sit-down or cocktail wedding receptions. A great saving on your wedding will make your heart soar this Valentine’s Day, am I right? Conditions apply, and you must book by February 28 to be eligible for the deal. Enquire online. A 7-course degustation menu with delectable dishes of the seafood tapas/roast suckling pig/crab risotto variety is calling your name from Noosa Beach House Restaurant & Bar on Valentine’s Day. Celebrity chef Peter Kuruvita’s unique style of cooking has been inspired by his global travels to remarkable locations. If you haven’t had the pleasure of experiencing his cuisine, you are in for a spectacular dining experience in a fantastic coastal location. Noosa Beach House is located within the Sofitel Noosa Pacific Restaurant, so you may as well order the accompanying wines and book a cheeky little room for the night! Bookings essential, call Georgina on (07) 5449 4771. Book a full or half day package for your wedding with Nicky Stone Photographer in the month of February, and you will receive a beautiful fine art wedding album for free in celebration of Valentine’s Day. Nicky specialises in fresh, artistic bespoke wedding photography, travelling worldwide to work with couples, who want quality images of their big day. We are lucky to have Nicky based right here on the Sunshine Coast. The sweetest gift of all – hand-painted watercolour Almond and Vanilla Bean Cookies, specially designed for local Valentines by SweetP Cakes and Cookies. 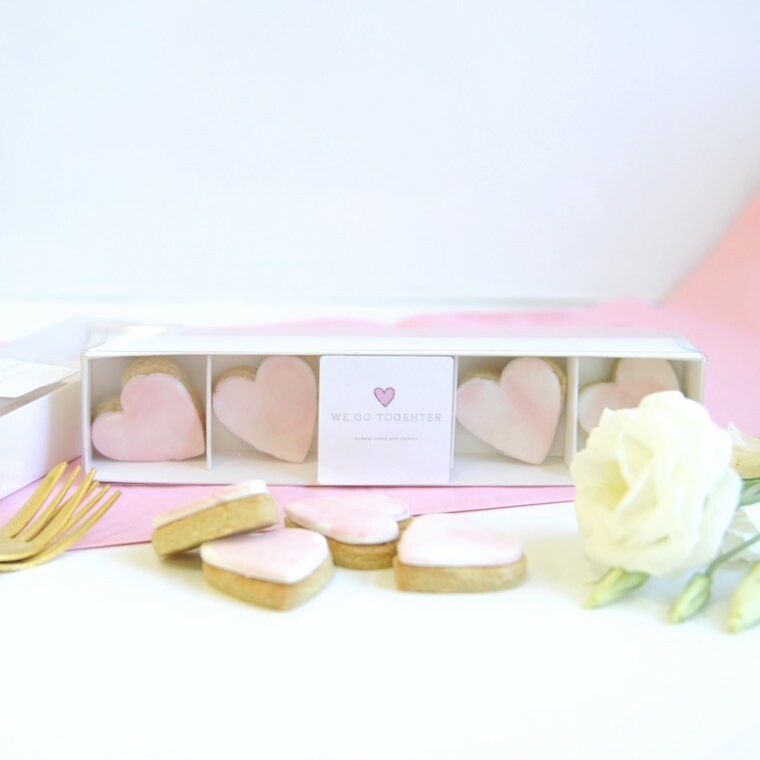 The heart-shaped cookies come in a pretty box and will set you back $12 per box. If a cosy atmosphere in the heart of Maleny sounds like your idea of romance, then this event can’t be missed. This is a rare opportunity to take in those unparalleled views of the Glass House Mountains while indulging in the wedding venue’s decadent cuisine. 10 courses of delicious cuisine will be served in a set degustation menu on Friday February 10 and Saturday 11. The wedding venue has opened its doors to the public on February 11, 18, and 19 as well for À la carte dining. Bookings are limited, so be sure to get in contact with the friendly staff at Tiffany’s to make your reservation.